Being ENOUGH is a four letter word…. Do you ever feel like you are juggling a million things at once? This was definitely my life last week. Sometimes I feel like pregnancy alone is enough to juggle but then add in the twins, the dog, my husband and anything else I happen to be doing and life can quickly seem out of control. Life can be overwhelming and instead of enjoying life we are trying to survive life. Then everything you usually do with ease and grace now seems like it’s mediocre. I feel like between everything I had going last week I barely saw the kids. I mean they were there – but SEEING them is a whole different thing. Insert mommy guilt. But thank goodness for Mondays! A brand new start to the week. A brand new week to make better than the last. But I’m still juggling. Aren’t we all? I’ve already started the day off getting the kids up and ready for school, visited a friend who just had a baby, popped in a frozen pizza, checked in on my book lady business, did some book lady leader duties, talked a little skin care with my mom, sister and sponsor, had a couple of phone calls and now sitting to write the blog post. Is the pizza ready yet? See all that juggling! It’s really incredible when I write it out all on the screen. Yet, somehow we, moms and caregivers of anyone, tend to not give ourselves enough credit for what we do on a daily basis. In fact, we largely feel like we didn’t do enough or worse, that we aren’t enough. That reminds me of this video I saw on Facebook this weekend about how we, moms, don’t feel like we are enough. I wish I had saved it to post in here. The video was moving for me because lately that’s how I have been feeling. Not enough. Are you feeling this way? That’s the Devil y’all. Telling us we can’t do something. Or we shouldn’t do something for ourselves. I would take a guess that this is a DAILY struggle for many people – not just moms. But how debilitating. That thought of not being enough can literally freeze you in time. Isn’t that what the Devil wants from us? Not to be everything that God intended for us to be. Not reaching our full potential. Even when we are reaching our potential, sometimes we have guilt for even doing that! It’s a vicious web we weave ourselves in! Well, I’m here to say YOU ARE ENOUGH. When you feed the kids chicken nuggets for the 3rd time this week instead of a home cooked meal – YOU ARE ENOUGH. When you haven’t taken a shower in 2 days and the house is a mess – YOU ARE ENOUGH. When you pour that glass of wine just a tad before 5pm because it’s just been one of those days – YOU ARE ENOUGH. When all you want to do is go to a hotel to sleep because you’re one more fight between your kids away from a mental breakdown – YOU ARE ENOUGH. When you have one of the best days with the kids and get everything on your to-do list done – YOU ARE ENOUGH. When you spend way too much money on something that makes you incredibly happy – YOU ARE ENOUGH. When you stay up late watching movies with your husband and know you’ll pay for it the next day – YOU ARE ENOUGH. When you spend anytime making sure YOU are taken care of – YOU ARE ENOUGH. I am the oldest of 4 kids in our family. I have one sister, who is 16 months younger than me and then 2 younger brothers (4 years and 8 years younger respectively). I always wanted an older brother but that’s just not how life worked for me. Instead my parents brought home this sister. 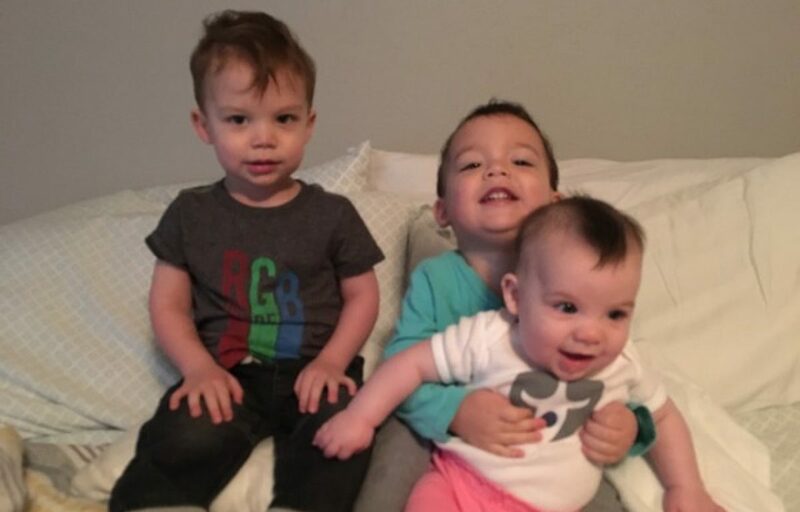 My boys are about to have a sister in about 4 months (I still can’t believe it) and there is just something about having a sister that is the most frustrating, at times, explosive, and most wonderful experience I have had in my life. I hope the boys feel the same with maybe a little less explosiveness but let’s be real, she will have TWO older TWIN brothers almost just like her daddy. I couldn’t be more excited her and nervous for them. Ha ha! The explosiveness. When I think about growing up with my sister, I think about her stealing my clothes and being a BRAT. Seriously. I would have to label my clothes to get her to stop taking them. I would get so mad. And she still took them. 😦 Why did it matter so much? Well, I’m sure it’s all about territorial things when you are growing up, right? I wasn’t the only one dealing with this I am sure. I’m also sure I was a brat too but this is my version of the story, right? 😉 Then when things really got crazy between us, my dad would sing us the song from White Christmas Sisters (Check it out here if you don’t know the song: https://www.youtube.com/watch?v=trD3Kqf-g0w). Man, that would really get our blood boiling! But I guess it would get us to stop for that moment. So parental mission accomplished. Did I mention she always ALWAYS got away with everything too? I mean life couldn’t get more unfair! Maybe she was just better at lying and hiding what she was REALLY up to – I have no idea but she seemed to NEVER get caught. Me, on the other hand, ALWAYS got caught. I was ALWAYS told I needed to be a good example. Totally UNFAIR. I mean she had younger brothers too! She still makes this face now. Anyway, as we got older and I mean, out of college, things were better between us – not great but better. I guess the whole growing up thing really helps. Plus, I was living in Dallas and she was finishing up her Masters with Texas Tech while living at home. Absence makes the heart grow fonder, right? 🙂 She was very helpful when it came to planning our wedding festivities and she was so supportive! To be honest, I was a little surprised, at the time, at how she listened to what I wanted and she was there for everything. It was really neat and memories I’ll keep forever. But really our relationship took the next level of understanding was when I was finally pregnant with the boys. I say finally because that wasn’t an easy process (we will get to that later in this blogging journey). In the weeks leading up to the boys being born, she changed. She grew up. My little sister literally grew before my eyes. I don’t know if that really happened and maybe I was the one who really changed but I saw HER for the first time. I understood her for the first time. We were really friends for the first time in our lives. The sister thing clicked with us and it was magical. In the photo to the right, I was doing my usual thing laying on the couch (I was so incredibly pregnant and miserable) and she wanted to take a picture of her with her nephews – so sweet. I had no idea that when the boys were born, next to my husband, she would be the rock in all of our lives. The boys were born at 34 weeks and lived in the NICU (neonatal intensive care unit) for 15 days at Memorial Hermann Medical Center (again, another part of the story that we will definitely talk about later on). While we were there, I’m pretty sure she came every day – the days run together when you are in the NICU so I have a hard time remembering exactly. Lucky for us, she worked in the Houston Medical Center so visiting was easy for her and it was helpful for me to have another adult there just to get my mind off the babies (well, as best as anyone could) and pumping and all the healing that needs to happen after a c-section. We came home from the hospital and my sister, with the help of my family, had cleaned and rearranged everything to help us transition better. In the days after the hospital, she continued her aunt journey with us. She lives in the Heights so it’s not exactly around the corner. But whenever she made it to Sugar Land, she would stop by. This was the best time because I got a break and the boys learned who she was and to this day, she almost makes weekly trips to see us. In January 2016, she became the godmother to Andrew when the boys were baptized. In March, she treated Nick and I to the rodeo for my birthday – a much needed night out. By April, she was on our first flight with the boys to Ohio to see family! I mean, pretty much when we need her to be there for us – she is and usually without a complaint (except for missing some sleep 😉 ). On July 11, 1989, my sister, Rene Louise Hoelker was born and I had no idea how she would rock my world but I’m glad she did. I didn’t know that when my parents brought home this little sister of mine that we would grow to have this special relationship. I truly believe all those fights (yes, even some physical ones) and all the misunderstandings brought us to this point of friendship. This sisterly friendship is one that I wouldn’t trade for anything. Author webkingrachelPosted on April 11, 2017 April 19, 2017 Tags aunt, awkward, boys, brothers, c-section, college, Dallas Texas, experience, feeding, flying, Fort Bend Discovery Center, graduation, Heights, hospital, Houston Texas, Houston Zoo, kids, life, magical, marriage, Medical Center, Memorial Hermann, memories, NICU, Ohio, opposite, parents, pumping, sisters, St. Agnes Academy, Texas Tech, twin brothers, twins, understanding, unfair, wedding, White ChristmasLeave a comment on “Sisters, sisters…. The journey here hasn’t been an easy one and not one I could even possibly share in one blog post. But here I am. Blogging! Who knew? It’s been on my mind for a few months. You know when you are bugged over and over by a thought but you brush it off? Yep! That’s this blog. Then something amazing happened. I connected with an organization called Caiden’s Hope (we will definitely be talking more about them throughout this blogging journey). Using my side biz with Usborne Books & More, we partnered together to raise funds for their organization (more to come later, promise!). One thing led to another and by the power of the Holy Spirit, the founder of the charity asked me to start this blog. BAM! The little thought was no longer brushed off and now 1 month later, we are here! This blog is intended to relate to a number of different journeys we are all on – marriage, kids and everything in between! It’s everything in between that life happens, am I right? So, take this journey of life with me…. I promise it’s an exciting one!